Sixteen students from Dundalk Institute of Technology took part in the protest at Sellafield last week which resulted in major traffic delays in Cumbria. Joyce Power, chairperson of the Institute’s Environmental Society described the protest as a great success. 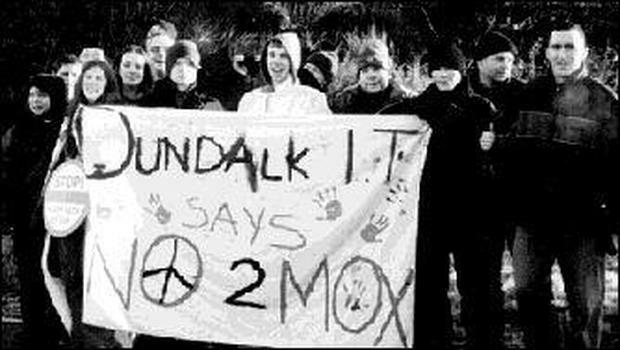 In all, 170 protesters from the environmental group Gluaiseacht and Global Resistance in Ireland and from Faslane in Scotland, took part in the protest against the commissioning of the mixed oxide (MOX) plant at Sellafield which recycles used uranium and plutonium. Eleven protestors were arrested after the protest, which resulted in six mile tailbacks. “The whole protest was very good-natured, with people playing music, and most of the police were very nice to us,” said Joyce. She said that the size of the nuclear reprocessing plant was overwhelming.